It's nice to have a day off. Time to sleep in, spend time with love ones, do some chores, run some errands... and in my case, go out to eat! Costanza had called me up earlier in the morning and wanted to see if I was up for breaky. Well, I would've been if I had been awake! Don't you hate people calling and waking you up? I suggested we go for lunch instead and he was game. I checked in with Rich Guy and he was available as well. What does he do all day anyways? Since we were planning to eat in Downtown, I also texted Kim. He is always game to eat! More the merrier! 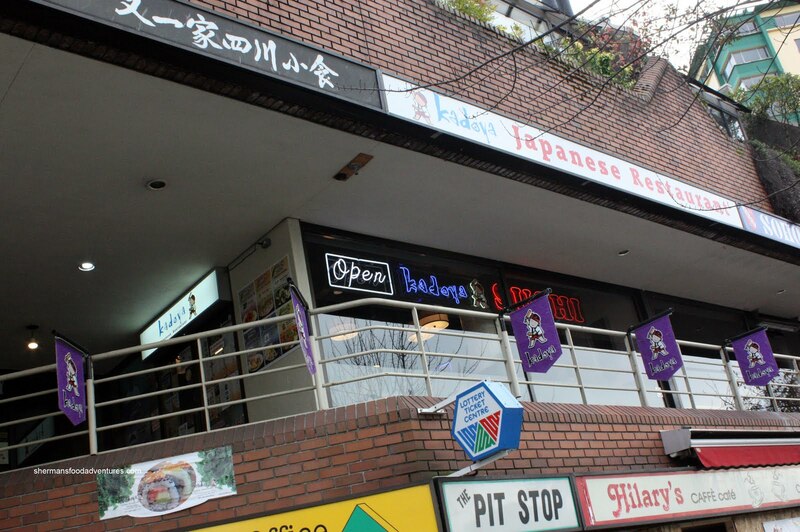 To make things convenient, we chose the new 2nd location of Kadoya on Denman at Davie. Kim arrived first and was able to score a table nearby the window. Not right by the window, but close enough. Kadoya is known for their specialty rolls and despite having 3 diners, we could only order so much. Thus, Kim hatched up a plan of ordering 2 of their lunch specials which gave the option of choosing 3 of their specialty rolls in smaller portion sizes. Hence, we ended up with 6 of their specialty rolls to try. A pretty good deal at $9.95 per lunch special. 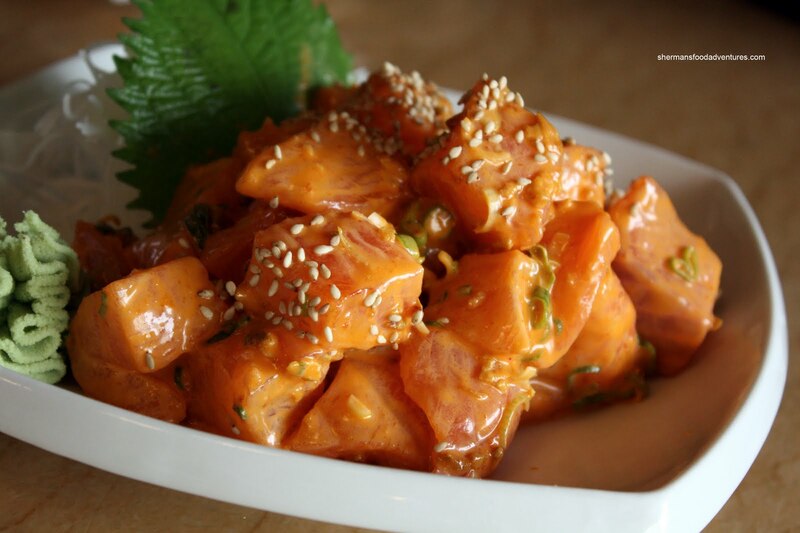 But before that, we had their Friday special in the Daily Sashimi, which was Spicy Salmon. Another good value at $8.99. Unlike some other places, the cubes of salmon were not merely hidden with an explosively hot sauce. Rather, we could still taste the salmon which had a fresh texture. It was slightly sweet with some kick; but only moderately. A good portion size for the money. Now onto the rolls starting with the Kadoya. Having been named after the restaurant, I had high hopes. Well, consider it meeting expectations. 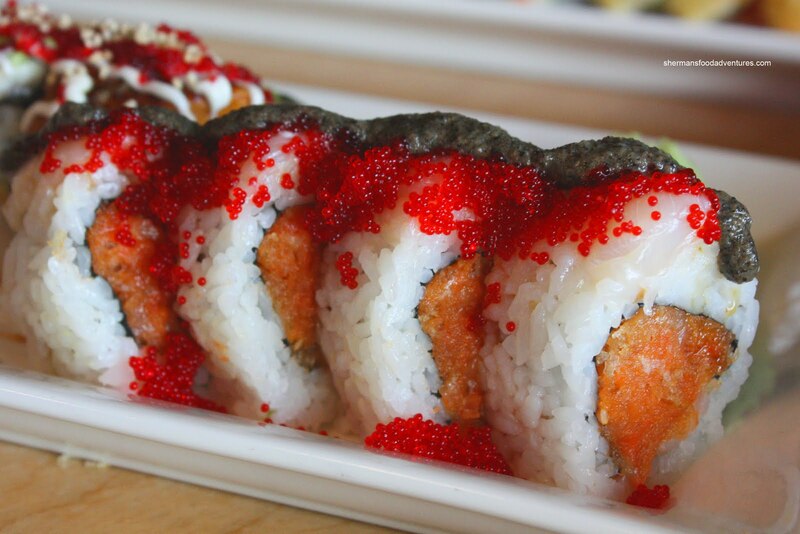 First of all, I loved the presentation with the different colour tobiko. The rice was moving towards the gummier side; yet it was not a big issue. I did get a hint of vinegar and some sweetness. 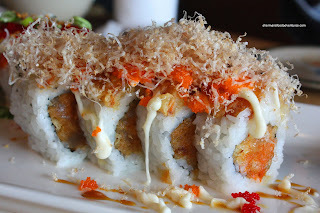 As for the roll itself, it is a combination of deep fried salmon skin and cucumbers on the inside with tuna tempura, tobiko, mayo and teriyaki sauce on the outside. 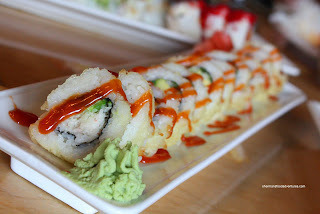 This was a well-balanced roll with some nice crunch and just enough flavour from the sauces. I can't say the same for the King's Roll though. 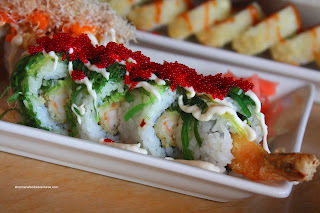 Consisting of prawn tempura (cold and soggy) and avocado on the inside with wild salmon, tobiko, green onion, garlic chips and honey mayo on the outside, the flavours just didn't seem to work. This is especially true with the honey mayo. The sweetness completely overwhelmed the other components. This would've been much better with an unagi sauce combined with something less sweet. Also consisting of prawn tempura and avocado on the inside was the Paradise Roll. On the outside, there was wakame salad, tobiko and sweet mayo. For me, this one was okay. Disregarding the stone-cold and soggy prawn tempura, the flavours were mild. The wakame provided the necessary flavour and the smoothness of the mayo brought it all together. The Volcano Roll was something truly a bit different. Inside, there was a mix of spicy salmon and tempura bits. On the outside, there was slices of scallops topped with tobiko and black sesame sauce. For me, the black sesame was the highlight of the roll.T he tempura bits did not provide the necessary crunch since they were soggy. If it weren't for the black sesame, nothing much good about this roll. Moving on, we got the Dragon Roll, which is a bit more common. 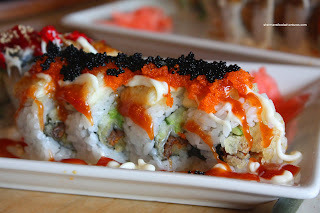 Consisting of prawn tempura and avocado on the inside with unagi, tobiko and mayo on the outside, this was a pretty standard Dragon Roll. Once again, the soggy and cold prawn tempura took away from the roll. No textural contrast; yet it did taste okay due to the sweet BBQ unagi. Now the award for worst roll of the bunch was the Canucks Roll. Much like the Canucks from the 80's, this roll was partially orange and really bad. Inside, there was Tony Tanti and Petri Skriko... uh... 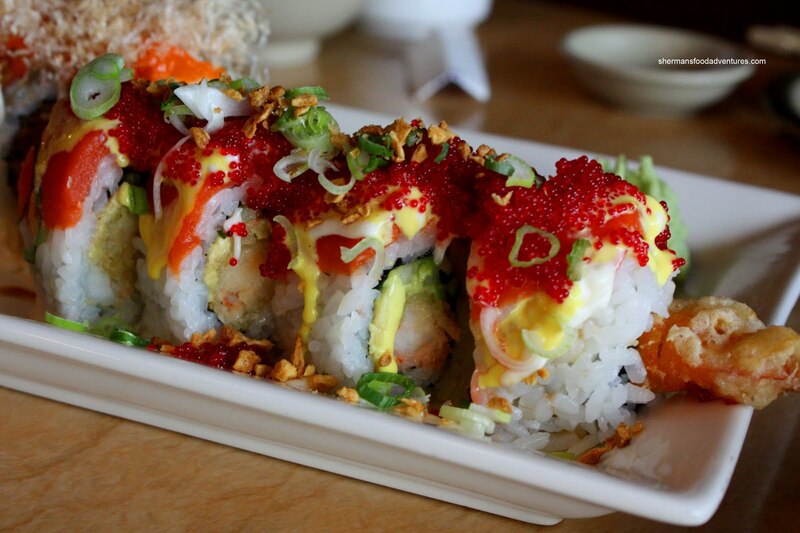 I mean spicy tuna with tempura bits. Outside, there was salmon tempura, tobiko, bonito flakes and sweet mayo. Due to the soggy nature of the tempura bits, the inside was chewy. To compound this issue, the salmon tempura was not only not crispy, it had the consistency of Ron Delorme (I mean tough...). 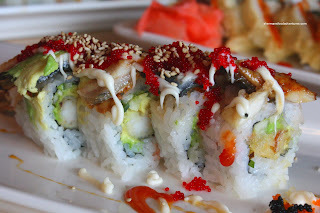 So we ended up gnawing on this roll without any joy of eating it. Our roll adventure didn't end there. We also got an order of their California Tempura Roll. At only $4.50 for 10 pieces, this was a pretty good value. However, the roll itself was pretty ordinary. Due to the deep fry job, the rice became very soft. In the end, the result was a roll devoid of any texture, it was all one mushy mess. However, it wasn't terrible. It's a standard California roll deep fried. I wouldn't complain much about it since it wasn't very expensive. For comparison's sake, we got a few cooked items to try. 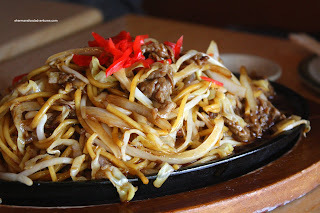 Since we had a huge overload of rice already, we opted for the Beef Yakisoba. I know, more carbs. What can you do? Hard to do any Atkin's in an Asian restaurant! The portion size of the yakisoba was quite good while there was a good mix of ingredients. However, the noodles were too soft and the whole thing was over-sauced. It was a bit wet. 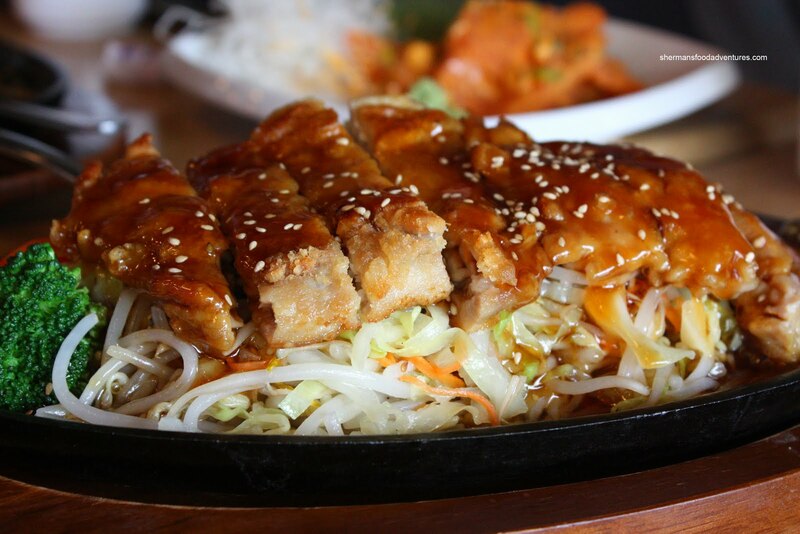 Curiously, it was served on a hot plate; yet it was not really sizzling. Not a horrible yakisoba, just a very average one. The second cooked entree was the Chicken Teriyaki. Once again, nothing inherently terrible with it; but nothing special either. It was a decent sized portion with plenty of fresh veggies underneath. Much like the yakisoba, the hot plate was not really all that hot. The chicken was decently tender and there wasn't too much sauce. The batter was okay in spots while a little soft in others. I have mixed feelings about Kadoya. There were some decent items mixed in with some forgettable items. I must admit that their rolls are quite aesthetically pleasing, in addition to being quite large in size. However, only a few worked. The other dishes we had were generous in size; yet, the execution in general was quite inconsistent. Almost all the fried components were universally cold and not crispy. They ranged from soggy to chewy. Not a good texture, especially in a roll that desperately needs crunch. With that being said, I thought their pricing was fair. It is very reasonable for what we got and considering the Downtown location. In terms of service, the one server was extremely overworked.